I have some updates from the Tower Garden Company about the LED grow Lights. If you haven’t read my post about the LED Grow lights, you’re going to want to click here and read it, I explain all about the lights, their benefits and more. Now Tower Garden growers thought they were GREAT! So great that every set of Grow Lights was sold much earlier than anticipated. The Tower Garden Company did everything they could to get new stock as quickly as possible. Sadly, they were unable to take back orders. But every cloud has a silver lining! 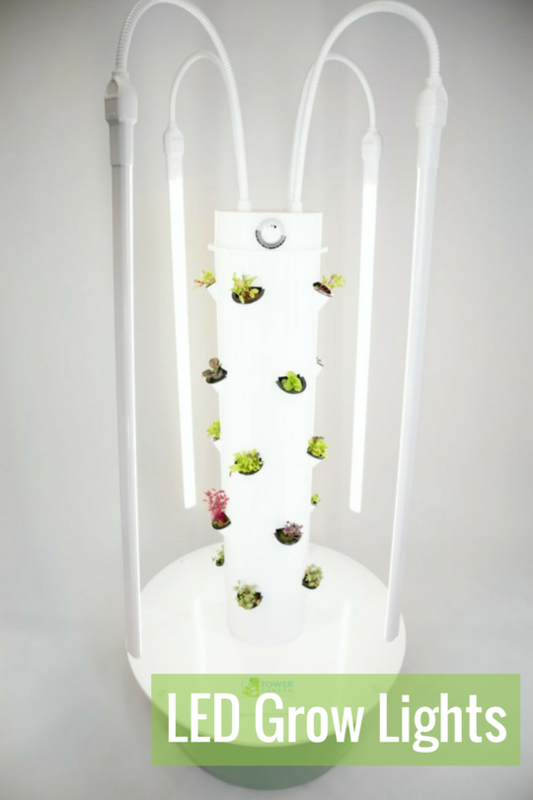 Even thought the LED Grow Lights are not yet back in stock, the tower Garden company has some options ready to go for when they are back in stock. They will offer the 12-month installment plan on LED Grow Lights without requiring you to purchase a Tower Garden unit. Once they are able to take orders for the LED Grow Lights, they will provide a limited time 30% shipping discount. The freight cost will be $14.00 per set. These special incentives will be made available through the end of May. Now that’s a company that’s got your back! Don’t worry, I’ll be sure to tell you when they are back in stock. How many sets are needed for one extended tower? You just need one set of LED Grow Lights for one Tower with Extension. Has anyone looked at the economics here? You’re growing $Zillion/head lettuce with LED’s. Think about it. Look at things in terms of total gross cost per/plant, with the equipment being written off over the current tax code allowances. It’s not effecint, Period. Do you have any hard cost/plant numbers using L.E.D. systems? Thanks. Great question! LED lights will cost you approximately $0.30 a day. So let’s play with some numbers. A Tower with lights will cost you $845 plus $109.50 for electricity. Lets say you were to grow only lettuce on a Tower. That would be 20 heads of lettuce at around $2.50 a head. You’ll grow a head of lettuce in about 4 weeks, often quicker inside with grow lights. So you’ll grow 260 lettuce in a year. 260 x $2.50 = $650, . So it will take you about 1.5 years to cover the cost. Don’t forgot, it will be so much fresher than ANYTHING you could ever buy in the store or at a farmer’s market and your Tower Garden will last for 15+ years! I’d say that’s ample time to recoup your investment. There’s also no risk of getting e-coli from your Tower grown lettuce either. Chuck. Quit being a LWB. Some of us just grow stuff because we want to. It’s been worth a lot of VALUE to me over the last seven years to just step onto my patio and grab a salad. Great and Thanks a ton to LIgingTowers for sharing such a informative guide. I have read your full article and gotten many point. Now, I want to Tower Garden growers Plants on 1900 Square Fit places. so, could you please tell me that, what kinds of sets needs for this places? and How many cost for this? Now I will wait for your opinion. I will save your site in my google drive and i will share it with my friends. I hope they will be benefited by this topics. It is nice when we can use led grow lights to grow plants indoor. How do you recommend for budget of $1000? Thanks. I would recommend a Tower Garden and the LED light kit. That would cost $845 plus tax. Please call us and we can help you with this. 352-357-4453. How much does it cost to have something like this? I have a budget of $2,000? Can you suggest with suitable ones? Thanks.